Gotta give Grandma credit, she adapts her “coerce the kid to eat healthy foods” strategies quickly. Aaaww, she’s so worried about not getting the flippers. XD Thank you Shawn! I’m reminded of Calvin and Hobbes… I think his dad convinced him that dinner was actually radioactive and would give him super powers. It’s all in the presentation. I loved Calvin and Hobbes! And I think I remember that strip too. Calvin’s dad was always good for a fun lie. I remember once he told Calvin old pictures are black and white because the entire WORLD was devoid of color until the 1950s. I’ve raised them on the rabbit making candy on the moon, wet-floor-sign plants that’ll melt your shoes, Africanized killer coat-hangers… there’s a wealth of fun stuff you can work with if you let yourself go outside the “normal” Santa, Easter Bunny, and tooth fairy. I think I’ve used the black-and-white one too, but they were a bit old for it at the time. Should’ve started younger; the magic only lasts so long. Well…at least her hair is already held back. @Kschenke: I don’t remember that, but there was one strip where he told him the rice in his food was maggots. Eeew. I remember that strip (it’s in one of my Calvin and Hobbes books)! He wouldn’t eat the rice but gobbled up the “maggots” so he could tell everyone at school what he had for dinner, lol. I know this is a little late (by almost a whole year) but my mom employed that same tactic with my picky palate. My favorite book back in the day was “The Grouchy Ladybug,” so she’d tell me that anything I wouldn’t eat was aphids and I’d automatically eat it. If I remember her file from the orphanage correctly, most plant matter is not necessarily poisonous, it just causes gastric distress – sort of like lactose intolerance, it won’t kill you to drink milk, but the results will be unpleasant. At least it’s a grape and not a peanut – if I recall correctly, she is quite allergic to those. I’m hoping she’s smart enough not to be coerced into eating anything she’s truly allergic to. triple-ply… cat AND demi-human’s best friend? Oh my… this will not end well. I feel sorry for grandma. All of her experience as a parent is telling her what she is doing is rite. 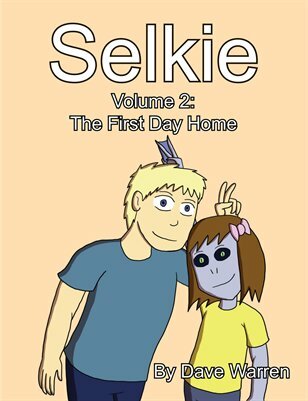 Selkie, as an eight year old faced with an experienced parent, lacks the skill necessary to protect herself. When grandma realizes her best intentions have manipulated Selkie into doing something harmful, she will be mortified. hmm, guess this will lead to the inspiration of her next drawing? OK somebody really needs to explain the ‘carnivore’ thing to Grandma. *Grabs a bucket and a warm wet hand towel* Poor Selki she going to be lying down ill for awhile or end up in the bathroom. Er… by computer I mean tv. The way things are these days, it’s probably both. A teleputer. Or compuvision. I’m also a little worried by that copy of “The Secret Kingdom”. Is Todd a Pat Robertson fan? Is The Secret Kingdom a real book? I just made it up because I wanted a title that sounded like a stereotypical pulp sword-and-sorcery fantasy novel. I was gonna use something long and complicated like “The Sword of the Star Savior”, but it wouldn’t fit and remain legible. Oh my god, I want NOTHING to do with Pat Robertson, implicitly or otherwise. I’m definitely gonna have to retcon the name of that book, thanks for bringing this to my attention. Ah, just a coincidence, then? Okay, cool. I didn’t *think* Todd (and/or you) seemed like a Robertson fan.